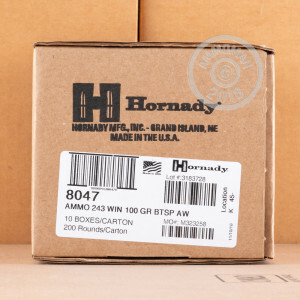 Hornady American Whitetail is a favorite among deer hunters thanks to its unerringly deadly performance and cost efficiency. 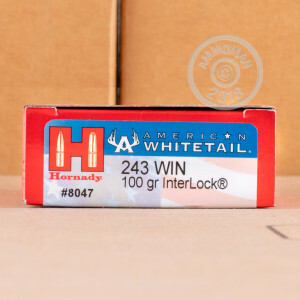 This .243 Winchester variant fires a 100 grain Interlock soft point bullet at a muzzle velocity of 2,960 feet per second, maintaining excellent long range accuracy thanks to its boat-tailed profile. 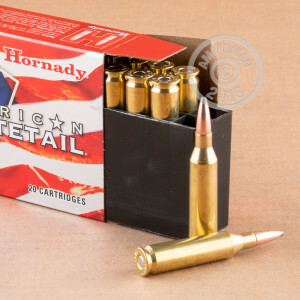 The Interlock bullet, as its name suggests, has a mechanically locked core and jacket designed to retain weight and expand consistently for high knockdown power against game animals.